The Equifax data breach put digital security seriously at risk. It’s more important than ever to know how to keep your information safe. A quick recap: Hackers gained access to the personal data of more than 140 million Equifax customers. To put that number in perspective, that’s about 45% of the entire U.S. population. The hackers exploited a vulnerability in the Apache Struts tool, which is used by government organizations and big businesses, and accessed social security numbers, birth dates, addresses, names and driver’s license numbers. The Federal Trade Commission has updated guidelines about the breach, and you can stay up to date on that here. You can also sign up for Equifax Credit Protection Services if you want to be even more careful. You probably already know that you can look up your credit report once a year at AnnualCreditReport.com. Don’t worry about checking your score more frequently than that: it doesn’t hurt your credit. Checking your own score is called a “soft inquiry.” Soft inquiries don’t ding your credit. “Hard inquiries,” like a lender or credit card company checking your credit for loan or mortgage applications, do lower your score a bit. You don’t have to log into your account consistently to keep an eye on your credit activity. You can also sign up for weekly emails and alerts at Credit Karma. If you’re concerned that your credit may have been compromised, you can put a freeze on it. This means that it’s going to be much more challenging for someone to open new accounts in your name. If you opt for a freeze, keep an eye on your current accounts; thieves can still make charges to open accounts. This might seem like an unnecessary step, but taking a little time now can protect super sensitive information later. You can also look into security alerts to keep you on top of unusual account activity, like notifying you of any charges over a set amount. Fraud alerts are another effective way to boost your credit protection. The Federal Trade Commission has an in-depth guide to putting a fraud alert on your credit report. The whole process takes less than five minutes, so it’s worth your time. You can renew your fraud alert every 90 days, which you should take advantage of – hackers might wait awhile to disperse information until after the news of a breach dies down. You can renew your fraud alert every 90 days, which you should take advantage of – hackers might wait awhile to disperse information until after the news of a breach dies down. Need a reason not to procrastinate on your taxes? The sooner you file your taxes, the less time a thief has to steal your refund or get a job using your information. Reply right away if you receive a letter from the IRS. 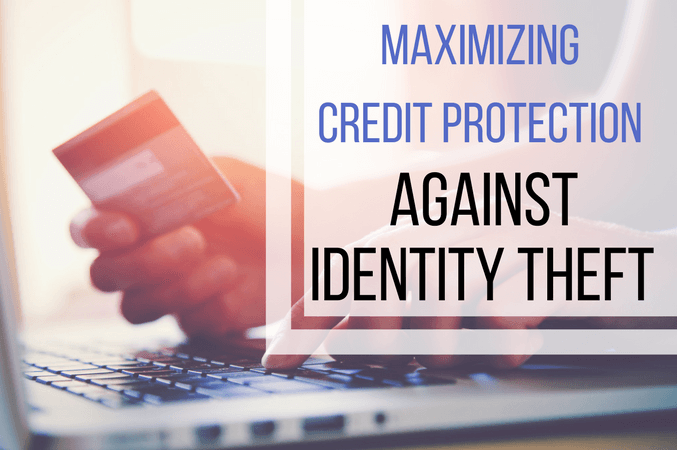 If you’re nervous about your credit protection, these steps will help you cut down on your risk of identity theft. But don’t just use this information after the Equifax hack – get into a habit of checking up on your credit and keeping your accounts as safe as possible.